Sponsored by HealthCare Resources Puerto Vallarta, the U.S. Consular Agency and the Hotel Marriott, this no-charge event is open to all nationalities and features 50 health care-related exhibitors from the Banderas Bay area covering everything from insurance to hospitals, plastic surgery to orthopedics, and everything in between. 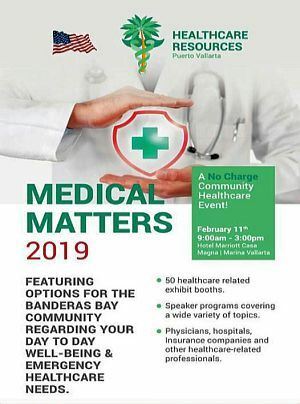 In addition, Medical Matters 2019 features a non-stop speakers program throughout the day with local physicians addressing a wide variety of health care topics. No reservations required. Keep checking this page for speakers programs, bios on each speaker and topics and lots more information! CasaMagna Marriott Puerto Vallarta Resort & Spa is located at Paseo de la Marina Norte #435 in the Marina Vallarta area. For further information, contact Pamela Thompson at pamela@healthcareresourcespv.com, or 322-107-7007.